Laddering Term Life Insurance can provide different levels of term life insurance coverage over a period of time. 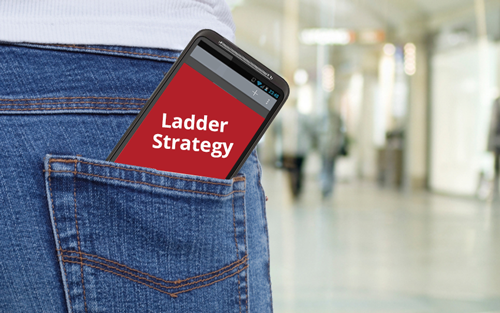 Laddering or layering several different term lengths can help address different time horizons associated with different needs for life insurance. For example, young couples with mortgages, debt that will decrease over time, plans to fund college education, and/or income replacement needs. This strategy works best with clients who are under-insured when their financial responsibilities are highest or over-insured as their financial responsibilities decrease. Legal & General America, through their Banner and William Penn companies has developed riders you can add to a base policy, rather than doing it through separate policies. In the above example, one would purchase a 30 year base policy of $1,500,000, then add the following riders: $300,000 for 20 years, $100,000 for 15 years and $100,000 for 10 years. 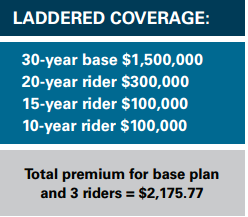 As each rider expires, the cost of the rider would disappear as well. Review your client files for potential prospects. Take a look at their client profile and find those who are a good fit (look at age, asset types, occupation, marital status, financial goals etc.) You can also use your annual portfolio or policy reviews to identify opportunities. If you have used this strategy before, comment below and share with others how your client has benefitted from this strategy.